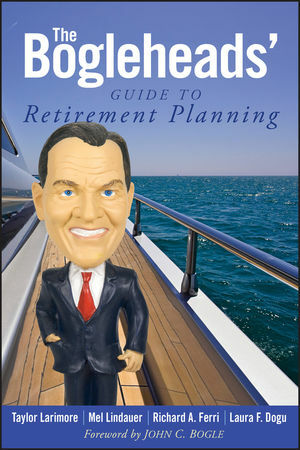 With The Bogleheads' Guide to Retirement Planning, you'll discover exactly what it takes to secure your financial future, today. TAYLOR LARIMORE has been dubbed by Money magazine as "the Dean of the Vanguard Diehards," and Jack Bogle himself calls Taylor "the King of the Bogleheads." Now eighty-six and retired, Larimore regularly spends several hours a day answering questions for free on the Bogleheads.org forum. MEL LINDAUER was dubbed "the Prince of the Bogleheads" by Jack Bogle. Together with Taylor Larimore, he initiated and continues to organize the grassroots Bogleheads annual meetings. Lindauer has been quoted in a number of newspapers and magazines and has appeared on CNNfn. RICHARD A. FERRI, CFA, is a key member of the growing Bogleheads "brain trust" and founder and CEO of the investment firm, Portfolio Solutions, LLC. He is the author of seven books, including The ETF Book: All You Need to Know About Exchange-Traded Funds and The Power of Passive Investing, both published by Wiley. LAURA F. DOGU, called "the Queen of the Bogleheads," participated as an investment panelist during the Bogleheads meetings for the last four years. Dogu is a career Foreign Service Officer with the U.S. Department of State.